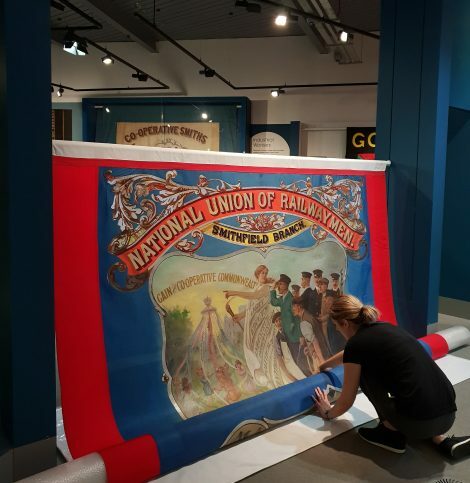 Although the banners in our collection may have once been seen as ‘working’ objects, many are now very fragile and can be quite challenging to care for. Textiles are vulnerable objects as they can be damaged by light, dust, extremes in environmental conditions and even hanging when on display. 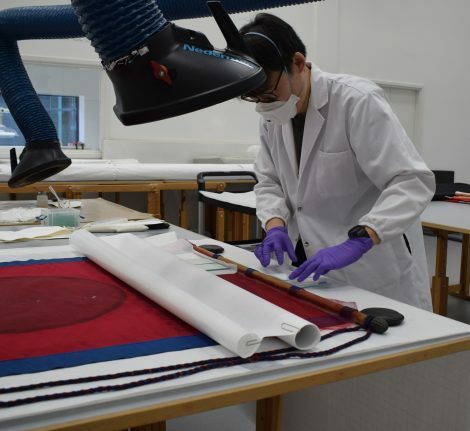 For this reason many of the banners in the galleries are changed annually, this is part of our preventative conservation strategy for the collection. Each banner is carefully lowered and checked for damage before being packed away. Banners selected for display must be thoroughly checked and conserved before they are ready to install. 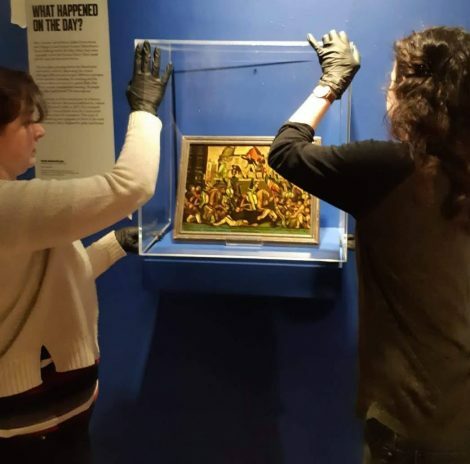 Not only does this give us the opportunity to exhibit more of our collection around the chosen theme for the year, but we also conserve at least one banner every year that has never been on display to the public before. Our collection is also made up of a wide variety of objects from our political history such as posters; placards; ceramics; and even furniture. These are often everyday items that were used in now-extraordinary moments in history, and include objects such as Michael Foot’s broken cane, fixed with parcel tape; a plastic miners’ strike collection tub with adhesive stickers; the Polyurethane Spitting Image puppet of Harold Wilson; election balloons from 1995; and a placard from the Women’s Marches in 2017, decorated with felt-tip pen. 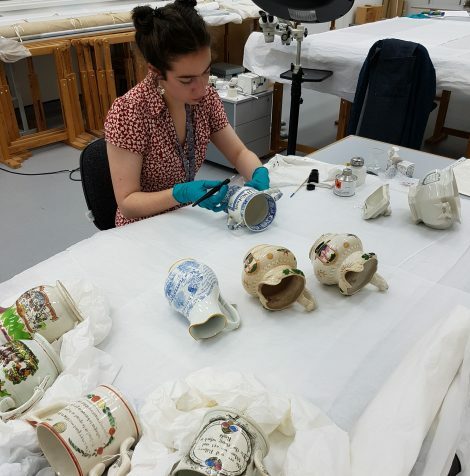 These objects are made from a wide variety of different materials, each requiring a specific type of conservation care for both storage and display. We also have a core involvement in the programme for each years events, significantly, the annual temporary exhibition. These exhibitions are always different, and we work closely with the Programming team to select objects from the collection that illustrate each chosen theme. We provide advice on the design to ensure the safety of the objects whilst on display; this can also involve making the mounts for objects and the framing for paper and prints. The practical conservation that we undertake for exhibitions is minimally interventive. This means that it is enough to prevent damage occurring while on display, but is not intended to make the object look like new. This is part of our ethical framework as conservators. Teaching in this way is central to how we plan for the care of the collection. This gives us the chance to conduct conservation treatments and projects that may not otherwise happen, as part of teaching and learning experiences.